What will the cities of tomorrow look like? Some students at Sacred Heart Catholic School in Boise have a creative and complex idea about that because of their math and science teacher, Carol Gado. "I love introducing the kids to some new concepts and ideas and seeing them get excited and have aha! moments," Gado said. As part of that teaching philosophy, Mrs. Gado challenged a group of eight eighth graders to plan for the future. They entered the Future City Competition. This year's theme? "To design a resilient city 100 years in the future that's able to withstand a natural disaster," Gado said. Eighth-grader Joshua Horn describes the idea the team came up with. "Jakarta (Indonesia) got hit by a tsunami in the future, and we wanted like a new Jakarta. So we chose Baru (for the name of their city) because Baru means new." They used recycled materials to build their model of Baru, including cardboard, bottle caps and even a printer motor. 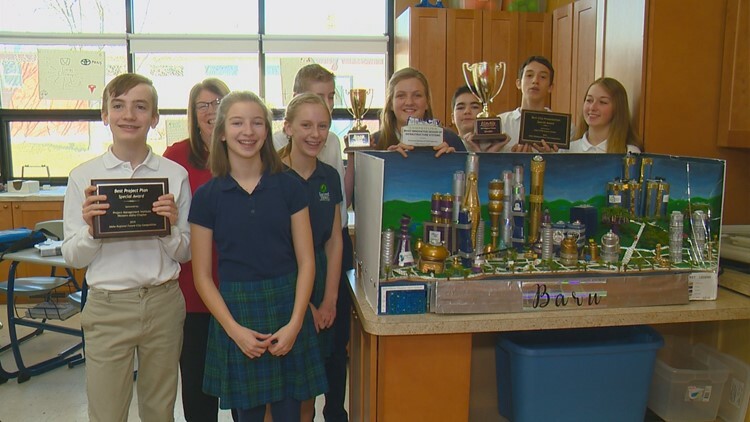 Eighth-graders designed Baru for the National Future City Competition. The model is roughly two feet by four feet. It has moving parts and a complex power grid concept. "We used wireless laser energy transmission for our power," Horn said. "That was their huge innovation," Gado said. "They found it's on the cusp of technology today. There are papers written about it in academia." The model also has a retractable sea wall to protect Baru from tsunamis. Team Baru won the Idaho Regional Future City Competition in January. They then took their city to Washington, D.C. for the National Future City Competition in February. All the months of hard work and teamwork paid off. They took fourth place. "I was kind of just stunned because there were a lot of other really good teams there," team Baru member Alyssa Murrin said. "We were like screaming and our families were watching and they were all like freaking out, too," Joshua Horn said. "Oh, it was awesome," Gado said. "It was unbelievable that when they called Idaho I think we all jumped 10 feet in the air." The team received a trophy and a small money prize for Sacred Heart Catholic School's STEM program. Gado says the best part for everyone was the trip to D.C.
She is this week's Innovative Educator. If you'd like to nominate a teacher, you can email us at innovativeeducator@ktvb.com.